Pamela Morgan is one of the leading names in the early history of the traditional music of Newfoundland. She was the lead singer of the legendary group Figgy Duff, who recorded 2 LPs and 2 CDs in the eighties and early nineties. It was their music that brought the traditional music of Newfoundland back to life. Unfortunately, Figgy Duff came to a tragic end and now Pamela Morgan not only has a solo career but also runs her own record label: 'Ambermusic'. In this interview she tells about the rise and fall of the band, her solo career and her drive to start a label of her own. Pamela Morgan grew up in a house full of music and in her family the piano played an important part. She tells about these early days. Pamela Morgan: My mother taught classical piano in our home. I have three older sisters who all played the piano, so I heard a lot of classical music and know it intimately. I remember the frustration I felt on hearing a student constantly missing a B flat, for example. When I got older, I listened to my sisters' records. Joan Baez was a favourite of one of my sisters, another one loved R&B and then there were the campfire songs from my Girl Guide days. I guess I was influenced by all the above-mentioned music, but I am particularly grateful for my knowledge of classical music. The latter gave me a strong sense of countermelody and improved my arrangement skills. These proved to be useful when accompanying traditional music, most of which was originally sung 'a capella'. Besides playing the piano, I sang in the church choir. At high school I discovered the guitar. I actually did not write any songs before the third Figgy Duff album. I was amazed that Pamela Morgan talked about classical music and the church choir, but not about traditional music. Was there no traditional music around in her childhood? When I was young traditional music was considered to be representing a backward way of life, which people were trying to forget in favour of a more modern lifestyle. 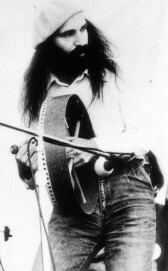 Nowadays, people embrace and celebrate their culture and their music; partly influenced by the cultural revolution in the 70's, in which Figgy Duff played a major role. Figgy Duff indeed played a major part in the revival of the traditional music of Newfoundland. Where did the idea of such a group originate? Figgy Duff was Noel Dinn's idea. Noel was a visionary and a strong-willed person. He wanted to take Newfoundland music out of the rut it was in. He rediscovered the older ballads, beautiful laments and unique dance tunes and presented them in a rock format in order to attract a wider audience. We were influenced by Pink Floyd, Jethro Tull and Fairport Convention. Public and press loved it and we got great reviews, both for the music and the sonic quality. We were excited, of course. Back then a record was a big deal, not like today when technology allows practically anyone to make a CD and the market is flooded. If you had the good fortune to commit something to vinyl, you were very special indeed. I love our first record, as I love them all. My definition of success is: being able to look back and be proud of all your work. I have achieved this. The first two albums mostly contained traditional songs arranged in a modern rock way, but the last two albums are quite different. The music is more peaceful and, most importantly, no longer consists of traditionals but of songs they wrote themselves. The members of Figgy Duff worked together for 19 years and only made 4 albums. There were personal changes, continual financial struggles, label interventions, etc. Change is natural and inevitable over a long period of time. The cultural revolution had succeeded and we no longer felt the former urgency to save traditional music as there were other bands following in our footsteps. Noel had written a wealth of original music that needed a voice and, especially as he knew that our last record, Downstream, would be his last, there were still a number of things he wanted to say. Pamela Morgan already mentioned that Noel knew Downstream would be their last CD. He died in 1993, which meant the end of a creative mind and the end of Figgy Duff. Two years later she decided to start a solo career and her own record label. Noel was strong, fierce, passionate, gentle, visionary, wise. From the time we met till the day he died, there was hardly a day we did not communicate in some way. He was my mentor, soulmate and best friend. Around the time Noel died, there were only two of us actually committed to "the band"- I was committed to helping him realize his final work. It was a very difficult time. We had just produced an album for Emile Benoit, master fiddler and close friend, and he died. Both my parents died. Then Noel died. All during the space of three years. By then I felt numb and the only way I could deal with so much grief was to throw myself into my work. My first solo album has four pieces of Noel's on it - I guess I was trying to keep him alive. I also succeeded in acquiring the rights of the Figgy Duff catalogue and started a label. It was not actually a conscious choice of mine to "go solo". Her solo CDs all have their own atmosphere and are quite different in sound and style. Figgy Duff started to sing traditional music and later used original material, but on her solo CDs it’s the other way around. "Ancestral Songs" differs from "On A Wing and a Prayer" in that "Wing" mostly consists of original material (mine and Noel's) and has more instrumentation, while "Ancestral" only contains traditional material. The latter is very basic - just me, my guitar and a guest fiddler on four tracks. These songs I've known and loved for many years, but I lost track of them for some reason or another. The theme of the record is: songs from the oral tradition, which I used to learn them from traditional singers in Newfoundland. I recorded it in England, at a friend's studio, and the fiddler is Fairport Convention's current fiddler, Chris Leslie. It was great, because he was familiar with the English version of many of the songs and was fascinated with my versions. I think he played brilliantly. Between the two albums I mentioned earlier, I recorded another solo album, "Seven Years", which is different yet again. On this album I play the accoustic piano and I am accompanied by a pedal steel player and a bass player, who also played on the last two Figgy Duff albums. As you can see, there are different sides to Pamela Morgan and this is one of them. As you are reading this interview, Pamela Morgan is engaged in another of her many new projects. What can we expect from her in the near future? Right now I'm working with a theatre company, producing Shakespeare's "The Tempest" with an original score that Noel and I wrote. Later in the season we will also be producing "The Nobleman's Wedding", a folk opera I wrote. I intend to record both of these productions. I am also producing a CD for the "March Hare", a music and poetry festival which will tour Canada and Ireland in March 2007. Apart from that, I am working on a book with original piano scores of Newfoundland songs and will be touring in England in October. The music industry is changing rapidly. CD sales have dropped and the label as it stands is not feasible. I am in the process of digitalizing the catalogue and offering the albums as downloads, instead of manufacturing CDs. I'm tying up loose ends and am preparing to travel less, take more personal time and re-focus my dreams as my priorities change. More info about Pamela Morgan, Figgy Duff and the Amber label at www.pamelamorgan.ca and www.ambermusic.ca. Figgy Duff: Same (Amber 9805), After the tempest (Amber 9800), Weather out the storm (Amber 9801), Downstream (Amber 9802). Pamela Morgan solo: On a wing and a prayer (Amber 9803), Seven years (Amber 4289), Ancestral songs (Amber 6550-2). Photo Credit: (1) & (3) Pamela Morgan (taken from website); (2) Noel Dinn (unknown).